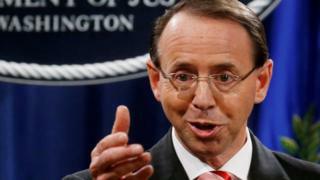 Rod Rosenstein, the US deputy attorney general who oversaw the inquiry into alleged Russian meddling, is to step down by mid-March, US media say. Reports emerged last month that Mr Rosenstein planned to quit once incoming Attorney General William Barr took over. Mr Barr's appointment was confirmed by the Senate last week. Mr Rosenstein has frequently been the target of President Donald Trump's criticism. A justice department official quoted by Reuters said Mr Rosenstein's decision was not linked to renewed claims that he had once suggested secretly recording Mr Trump. In a TV interview on Sunday, former-acting FBI chief Andrew McCabe said talks had been held in 2017 about invoking the 25th Amendment of the US Constitution that could remove a president deemed unfit. He said Mr Rosenstein had held discussions on the number of cabinet members and others needed to invoke the clause. 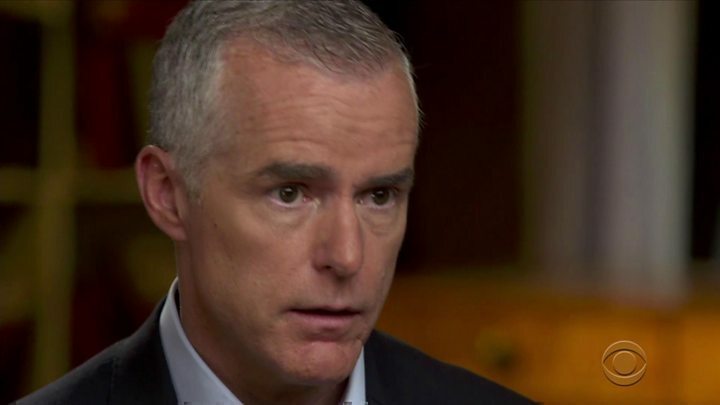 Media captionMcCabe: "There were concerns about Trump's intent"
President Trump reacted furiously to the interview, tweeting of "illegal and treasonous" behaviour and an "illegal coup attempt". The White House said Mr McCabe, who was fired last year for allegedly lying to government investigators, had "no credibility". The justice department said Mr McCabe's account was "inaccurate and factually incorrect". Mr Rosenstein has previously denied having any such discussions about invoking the amendment, describing the reports as "inaccurate and factually incorrect". He was given oversight of Special Counsel Robert Mueller's inquiry into suspected Russian meddling in the 2016 presidential election when former Attorney General Jeff Sessions recused himself. But after Mr Sessions was ousted in November, his replacement Matthew Whitaker took over the investigation, refusing to recuse himself despite his previous public criticism of the probe. Mr Rosenstein continued to help supervise the inquiry. Video The 25th Amendment: Could it be used to unseat Trump?